Pakistani fashion Designer Nadya Visage launched her new Summer fashion dresses collection 2012 named Splattered Retro Collection. Visage Designs To make you Flaunt is a fabulous fashion boutique they serve their customers with high class fashion & inspiring designs. Nadyas Visage who deals in all kind of Desi Eastern & new trend style clothing, is of the most anticipated names in the field of the fashion industry of Pakistan. They deals in designer wear, designer replicas, kurti/tunic, party & casual wear & Branded cotton & Lawn suits. This collection has consists of fancy & stylish A-line shirts, Long Shirts, Anarkali Dresses, Frocks, Salwar Kameez & Churidar Pajamas. These formal wear dresses are available in different colors. 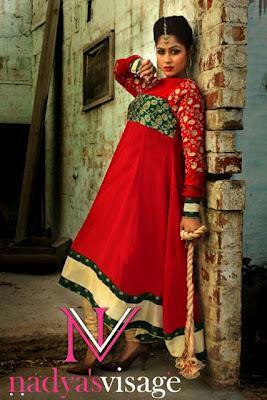 Check out this excellent embroidered pret line summer womens fashion collection 2012-2013 for females by Nadya Visage.